One of my biggest regrets in life is that I do not like sweets. I have literally tasted like 5 types of candy bars in my life. For the next 52 weeks I am going to eat 1 entire candy bar a week, rate them and document my impression of these treats. Never again will someone say to me “have you ever had a Heath bar” and I will not be able to instantly respond with “yes”. 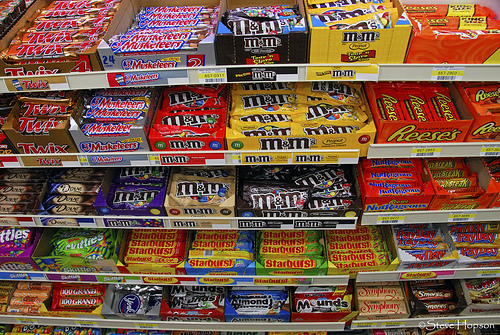 Don’t tell me there are other candy bars, there are not. These are the standard candies and there’s no plan to have crap like the Milky Way Dark Midnight bar… it’s gonna be the Milky Way classic speaking for the entire Milky Way family of bars. Here’s the 52 snacks I will be enjoying. I’m going to do my best to go in alphabetical order. I realize there are more than 52 on this list but some of them are going to be tough to find and that not all of them are actually candy bars. This is going to be great. I have a feeling that the tootsie roll review is going to be revetting! Good luck Chip. violet crumble? im pissed i have to wait until Sept ’13 to hear about this mysterious treat……..
Can I jusst sayy what a comfort to uncover someone that genuinely understands what they are talking about on the web. I can’t believe you’re not more popular given hat you sureloy possess the gift. I don’t comment, however after reading through a great deal of remarks on Candy Bar Challenge | chipwrecks. if it’s okay. Could it be just me or do some of these responses come across like they are coming from brain dead visitors? 😛 And, if you are writing on other places, I would like to follow everything fresh you have to post. Could you post a list of the complete urls of all your social community sites like your linkedin profile, Facebook page or twitter feed? On peut νous diire que cе n’est guèrefaux ..
Euh êtes vօus sûг de ce que vous dites ?